Sun-filled vacation rental in the center of town, situated behind the 141 Bradford Natural Market, on the second and third floors of a three story stand-alone building. This unit is tucked away at the rear of a small condo complex, away from street and pedestrian noise, with tons of natural light, water peaks, and unobstructed views of the Pilgrim Monument. This duplex unit has three bedrooms and two full bathrooms with natural river stone flooring. The condo features high end furnishings with designer lighting, central air conditioning and hardwood floors throughout the large, open floor plan. The first floor has a comfortable living room with WiFi, HD cable and Bose sound, streaming capability (Chromecast from Google), Bluetooth connectivity to the sound system, chef's kitchen with stainless steel appliances and silestone countertops, and dining for six guests around a large table. A private deck with town and monument views is located right off the dining area. There is one bedroom and one full bathroom located on the first floor. The second floor has two bedrooms (one with a Bose Wave Radio) and the second full bathroom. The unit comes fully equipped with a dishwasher, washer and dryer, both a coffee maker and Keurig, and all amenities one would expect. Conveniently located near the Bradford Natural Market, Far Land Provisions, and a short walk to the ferry or the beach. Offstreet parking for one car is included. A perfect getaway place right in the center or town, just steps away from shops, restaurants and all the conveniences. Proud owners looking to share the Provincetown experience. We purchased this home in June 2015 and are making it available to guests in July and August. We continue to make enhancements with new furnishings (both inside and out) and will update the site with additional pictures as they become available. In the meantime, we hope you enjoy your stay. This property gives you the ability to host friends and family or simply relax and enjoy a leisurely escape. The open floor plan makes hosting gatherings easy and the private deck with town and monument views provides the perfect backdrop for a memorable vacation. The unit has two full bathrooms, one located on the first floor and another on the second floor. The first floor bathroom has a stand-up shower, pedestal sink, tile flooring and ample storage. The second floor bathroom has a unique natural river stone floor, stand-up shower, pedestal sink and ample storage. Kitchen comes with both a coffee maker and a Keurig. Chef's kitchen with silestone countertops, stainless steel appliances, a full pantry and all the amenities you come to expect. Dining table comfortably seats six. The breakfast bar adjacent to the dining area offers additional seating for two. Holds an outdoor sofa, chair, coffee tables and tilting sun umbrella. Perfect Location with Comfort and Style! My roommates and I planned a girls weekend getaway this year to Provincetown and were very fortunate to have stayed at this property. It could not have been better located as we walked everywhere we wanted to go. Plenty of room to spread out and all of the comforts of home. We all would highly recommend!! We had a great week staying at this property. It’s in a perfect location and easy access to everything on Commercial Street. The house layout is perfect and very well kept and maintained. Would definitely stay there again! Centrally located, comfortable, fully stocked vacation home with awesome, attentive owners who care about the needs of the renters. Every space was fully utilized- the living room, the balcony, the kitchen, the comfortable bedrooms. My friends and I enjoyed relaxing at home in between shows, shopping, the beach, whale watching and all other great PTown events. My friends commented that the place was even better than they imagined and I agree. For those who enjoy cooking the kitchen is stocked with pots, pans, bowls and every imaginable gadget invented. There’s a full coffee pot in addition to a Keurig machine for coffee on the go. The tv/WiFi/sound system was great for those quiet nights at home or in case of inclement weather. A new friend that we met during our stay loved our place and he mentioned he would give up his current rental if this place was located on the waterfront. However the awesome view of the Pilgrim House and location close to Commercial street without all the foot traffic made our stay amazing. Lovely space, beautifully decorated, centrally located. Super conveniently located next to natural foods store and across from bike rental shop. Everything was beautiful, convenient and easy about this rental. 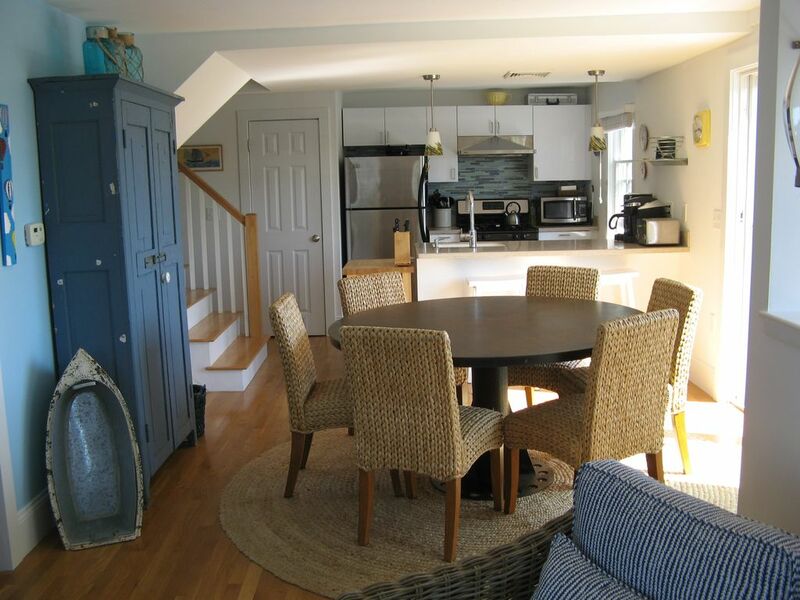 This apartment/condo is the perfect base for the ultimate Provincetown vacation experience. The space is beautiful, roomy enough for a big family or a few of your friends, and centrally located to allow everyone to do his or her own thing without need for a car (but it still comes with a parking spot, which is great). There is a sweet outdoor deck with a view of the monument and easy access to downtown. Best of all, Tom and Jonathon were incredibly helpful, kind, accommodating and flexible. What a great vacation we had! Book this and you could have the same!